Jan 07, 2002 New from Transducer Techniques an economically priced System combination comprising of our popular SWS (Socket Wrench Torque Sensor) and our PHM-100 Portable Hand-Held Transducer Indicator. This system provides accurate measurements of bolt or nut wrenching torques in either direction, so break-away torques can be measured. The PHM-100 has Peak Hold feature that captures at less than one millisecond, and operates on a 9-volt battery for 60 hours. The SWS is a reaction type torque sensor offered in 6 ranges from 10 FT . LBS. to 1000 FT. LBS. full scale. Accuracies are consistent with highly accurate strain gauge based load cells. 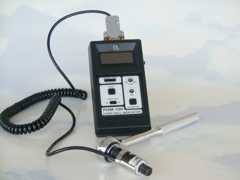 Combination kit includes SWS socket wrench torque sensor and PHM-100 portable handheld.